MOSCOW (Sputnik) - European Parliament chief Antonio Tajani lashed out on Monday at Venezuelan President Nicolas Maduro for expelling the parliament’s delegation and urged Brussels to act. "Maduro's regime stops MEPs from doing their job by expelling them. More proof that he is a dictator. I hope that the European Council will respond with measures in line with this latest outrage," he tweeted. Three Spaniards, a German and a Dutch lawmaker arrived in Venezuela on Sunday at the invitation of the opposition-run National Assembly to meet with its speaker, Juan Guaido, who declared himself interim president last month. Esteban Gonzalez Pons, of the conservative European People's Party, said the delegates' passports were seized upon the arrival and they were forced out of the country. 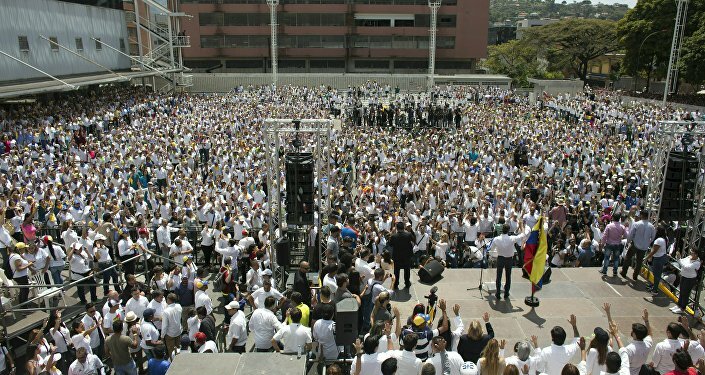 The Venezuelan Foreign Ministry later accused them of conspiracy. "Our parliamentary group, the most numerous in the European Parliament, demands that at the meeting of foreign ministers today the decision be made to withdraw from the contact group, to stop participation in the contact group," Pons said at a press conference in Madrid. He also demanded that the EU strip Venezuelan ambassadors to the EU of credentials. Spanish Foreign Minister Josep Borrell said the ambassador to Venezuela had unsuccessfully tried to talk Caracas into letting the delegates in. He condemned their expulsion. "Of course, we wanted them to enter and we condemn actions of the Venezuelan government led by [President Nicolas] Maduro, which puts [its legitimacy] into question," he told reporters in Brussels. Guaido has been recognized as an interim president by many EU countries and the United States, while Russia, China, Mexico and others continue to back President Maduro, who has called his rival a US puppet.